TUMEKE! 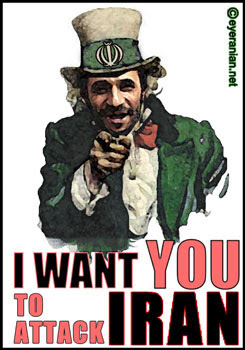 : Has it occurred to anyone that Iran is right? Has it occurred to anyone that Iran is right? There are all sorts of suggestion that the recent taking of 15 British troops by Iran yesterday is an attempt to rise tensions just before another important UN vote on their nuclear defiance. Yeeeeeah, but there is also the even simpler explanation that the British were in Iranian waters, and with everyone as terrified of each other and with all the pressure building up there, these stupid macho events can suddenly escalate into people shooting at eachother. Remember the Gulf of Tonkin incident? The USS Turner Joy and the USS Maddox ‘thought’ they were under attack from North Vietnamese naval forces. During a violent electrical storm both captains misread the instruments and believed they were under attack – based on this absurdity, the US President escalated Vietnam to the full on killing machine we fondly remember it to this day as. This event highlights why it is stupid to build up forces in a region with as much tension out there as this one is now exhibiting, it’s time to admit there isn’t a military solution to this problem and redouble our diplomatic efforts, the Iranian people want peace as much as we do. Royal Navy personnel seized at gunpoint by Iran in the Gulf have admitted being in the country's waters, an Iranian general has claimed. Gen Ali Reza Afshar told Iranian media the 15 personnel were being interrogated, but were in good health. The Foreign Office could not say where the group was being held. It insists they had not been in Iranian waters. Earlier, minister Lord Triesman met with the Iranian ambassador in London to demand their immediate release. Yes I agree now that the only solution is political. All military options have been exhausted by the US. When Field Marshall von Rundstedt, then the commander of the German troops on the western front late in WW2, was asked what should be done when the military outcome was dire, he responded famously "Make peace you fools, what else can you do?" He said this, not because of a moral predisposition torwards peace, but becuase the military options had been exhausted. Thus the only solution left for the US is political - make a settlement, pay the price. for purposes of funding a competitive annexation of Iraq by Iran. This funding to Iran is to provide a competitive market for the annexation of Iraq vs that of America. Only when there is competition for the annexation of Iraq(and it's oil) on the international level will free market economics come into play and a true and fair value of Iraq be obtained through the competitive process of annexation. I only hope I don't get the terrorist squad arresting me after I post my cheque and that I don't end up 7 years in a quantanamo prison without trial like that Aussie ranchrider who accepted a free ticket to Afghanistan from a Muslim. If they do not release these soldiers soon, the Brits should drop some serious ordanance on those f*cking backward desert snakes.